Howdy, forex friends! Canada is scheduled to will be simultaneously release its retail sales and CPI reports this Friday at 12:30 pm GMT. There’s therefore a very good chance that the Loonie may get a volatility boost. That also means that it’s time for another edition of my Event Preview. If y’all can still recall, I noted in my previous Event Preview that leading indicators favored a stronger monthly reading, which supported expectations that CPI picked up the pace. However, I also noted that historical data showed that economists tend to overshoot their guesstimates, resulting in more downside surprises and skewing probability more towards a downside surprise, at least for the monthly CPI reading. 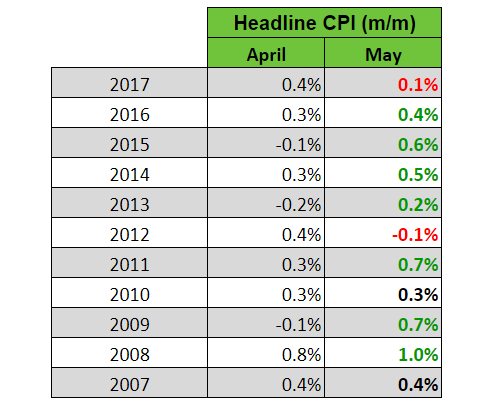 Well, it looks like the historical tendencies held true and the leading indicators were wrong since the April CPI report showed that CPI only increased by 0.3%, matching the previous month’s reading but a tick slower compared the the expected 0.4% rise. Year-on-year, this translates to a 2.2% increase, which is rather disappointing since the forecast was that the annual reading will maintain the +2.3% pace, which is the strongest since October 2014. As for the BOC’s three preferred measures for the “core” reading, the Weighted Median CPI and Common Component CPI were both steady (yet again) at +2.1% and +1.9% respectively. The Trimmed Mean CPI, meanwhile, was ticked higher from +2.0% to +2.1%. Looking at the details of the report, half of the 8 CPI components printed stronger monthly readings while the other half printed weaker readings. Also, higher transport costs due to the 6.8% surge in gasoline prices is the main driver for CPI growth. The main drag, meanwhile, was the 2.32% decline in the cost of recreation and education. Overall, the April CPI report was rather disappointing and the details didn’t really help to cushion the disappointment. The general consensus among most economists is that headline CPI rose by 0.4% month-on-month in May, which is a tick faster compared to the 0.3% in April. The year-on-year reading is also expected to accelerate from +2.2% to +2.5%. The prices index of the Ivey PMI report eased from 67.8 to 64.4 in May. The prices index refers to input prices, but higher input prices usually translate to higher CPI (lower in this case), provided that companies pass on their higher input costs to consumers. Well, CPI usually accelerates month-on-month between April and May, which supports the consensus as well as Markit’s findings. Even so, economists still tend to be conservative with their guesstimates since there are more upside surprises than downside surprises. To summarize, the leading indicators are mixed since Ivey is pointing to weaker inflationary pressure while Markit found that inflationary pressure picked up AND that manufacturers are passing on their highers costs, which will likely translate to a stronger CPI reading. And between the two, Markit’s findings are in-line with the consensus that CPI accelerated. And while historical trends do support the consensus that CPI picked up the pace in May, economists still tend to be overshoot their guesstimates, resulting in more upside surprises. And that skews probability more towards a possible upside surprise, at least for the monthly CPI reading. However, just keep in mind that we’re playing with probabilities here, so there’s no guarantee that the monthly reading will surprise to the upside. In my previous Event Preview, I concluded that probability appears skewed slightly more towards a downside surprise, based on the historical trends. However, I also noted that I wouldn’t be too surprised if the headline reading comes in better-than-expected, given the surge in imports of vehicles and parts back in March, which could translate to higher vehicle sales. Well, Canada’s March retail sales report revealed that the headline reading did surprise to the upside alright (+0.6% vs. +0.3% expected), thanks to stronger sales from motor vehicle and parts dealers. Vehicle sales are excluded from the core reading, though, so the core reading fell by 0.2% (+0.5% expected) since 8 of the 10 remaining store types reported weaker sales growth or even declines in sales. In summary, the March retail sales report was mixed on the surface but was rather poor overall since stronger vehicle sales practically drove the headline reading higher, while most of the other store types suffered, which is a bad sign for the Canadian economy. Most economists forecast that headline retail sales was stagnant in April (+0.8% previous). However, most economist also forecast that the core reading will bounce back with a 0.6% increase (-0.2% previous). Since the headline reading is expected to be flat while the core reading is anticipated to rise, then that means that there’s an implied consensus that vehicle sales will fall will non-vehicle sales will rebound. And conditions apparently didn’t improve too much since Canada’s May jobs report revealed that the wholesale and retail trade industries only saw a 3.1K increase in jobs. The jobs reports showed that wage growth continued to accelerate, though, with wage growth nearing a six-year high as of May, which could lead to stronger consumer spending. Canada’s April trade report revealed that imports of motor vehicles and parts plunged by 5.8% (+8.4% previous). The trade report also showed that imports of consumer goods dropped by 4.9% (+8.2% previous). Comparing retail sales in March and April, there seems to be no clear pattern, although there are slightly more instances when the headline reading in April was stronger. There is also no clear tendency for the core reading. As to how economists fared with their guesstimates, well, economists tend to be too optimistic with regard to the headline reading since there are more upside surprises. It should be pointed out, however, that the historical pattern has failed to hold in recent years. The same can be said of the core reading, although that historical tendency has also failed to hold recently. In summary, the leading and related indicators and reports are pointing to the possibility of a slowdown in both headline and core retail sales readings. A weaker headline reading is in-line with consensus but a stronger core reading is not. Historical trends, meanwhile, don’t offer significant insights when comparing the readings between March and April. However, economists do have a strong tendency to overshoot their guesstimates for both the headline and core readings, which skews probability more to the downside for both. But again, just remember that we’re playing with probabilities here, so there’s also still a chance that both headline and core readings may surprise to the upside. And as mentioned before, the historical tendencies didn’t hold in recent years. Like last time around, Canada’s retail sales and CPI reports will be released simultaneously this Friday. If both reports surprise to the upside, then the Loonie will likely get a bullish boost. On the flip side, if both reports disappoint, then expect the Loonie to get kicked lower. And in the event that the reports come in mixed, then traders usually put more importance on the CPI report because of its more direct link to monetary policy. The Loonie’s reaction to the previous reports is a good example of this since the March retail sales report was mixed on the surface (but negative overall) while the CPI report was a a flat out disappointment, which caused the Loonie to tank across the board. As for follow-through buying or selling, that usually depends on oil prices, so you may also want to keep an eye on oil prices as well, especially since OPEC will be holding its meeting on that day. And word on the street is that Russia and Saudi Arabia want an oil output hike, so stay frosty. And if you didn’t know, you can check out oil prices at our Live Market Rates page.